First off I apologise for not visiting your blogs recently as I am not so well but will be back very soon. 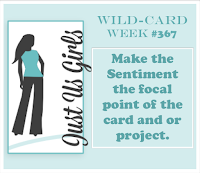 My posts have been pre-scheduled but I actually felt like a bit of crafting and have this post for you today. Over at Less is More they are celebrating their 300th challenge. A huge congrats to all of you at this challenge, we all love it and have a lot of fun playing along. I am here celebrating with a Christmas CAS card. A simple silver snowflake then a sparkle die. Can't get more CAS than this! This die is cut using glitter foam so super quick to make. I made a few more in a variety of colours-not a great photo but just wanted to give you an idea. You still have a week to play along so pop here and then get inky! Thinking of you Sandie! Love the set of cards you made. All the shimmer is fabulous! Hope you are feeling better soon Sandie, I love the set of cards here, the glitter foam sentiments look fab. So good that you felt like crafting again! Hope you will be better soon! Fabulous CAS card! I love the sparkle! 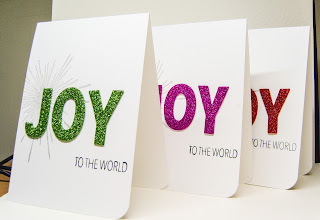 Thanks for sharing this beautiful card with us at Addicted to Stamps and More blog this week--please join us again soon! Fantastic set of cards. I really love that glitter foam. Sorry you have not been well-- I hope you are better very soon. 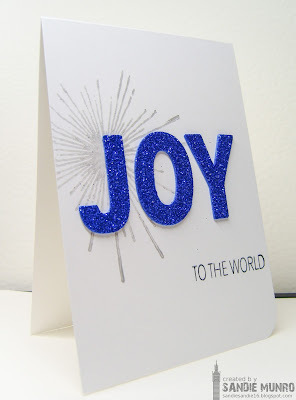 The accent on J at Joy does a great work, it makes the word really joyful:) Thanks for joining us at Addicted to Stamps and More!